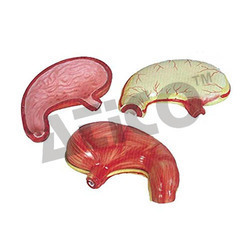 Pioneers in the industry, we offer brain with arteries on head, head with brain, heart models, stomach model, liver pancreas and duodenum model and liver model from India. Two halves brains can be disassembled into: frontal with parietal lobes, temporal with occipital lobes, half of brain stem, half of cerebellum. Dissectible into 9 parts, life-size. 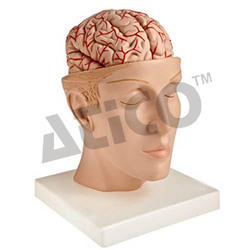 This model shows the head structure including brain structure inside the skull. Dissectible into 10 parts, lifesize. 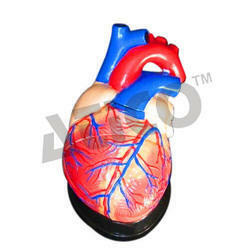 This heart model shows the anatomy of human heart with ventricles, atriums, valves, veins, and the aorta in great anatomical detail. The front heart wall is removable to view the chambers and internal structure. Dissectible in to 2 parts. This heart model shows the anatomy of human heart with ventricles, atriums, valves, veins, and the aorta in great anatomical detail. The front heart wall is removable to view the chambers and internal structures. Dissectible in to 2 parts. 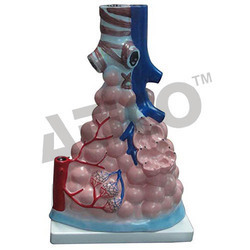 This model shows the anatomy of human heart with aortic arch, coronal section of atrium and ventricle, valves, and veins in great anatomical detail. 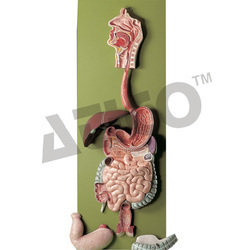 The model shows the structures of the gastric folds, pyloric valve, pyloric sphincter muscles, gastric mucosa and the transitional mucosa of the gastric-esophagus. Made of hard plastic and magnified 2 times of the natural size. 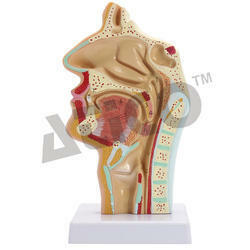 An easy way to study the basic structures of the liver, spleen, blood vessels and pancreas. External structures are illustrated as well as the pancreatic duct of the pancreas. 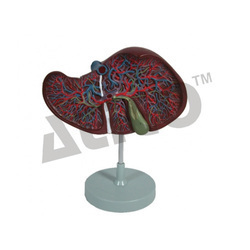 This model also shows the abdominal aorta and inferior vena cava. Life size. Dissectible into 3 part. Made of PVC Plastic. Mounted on stand. 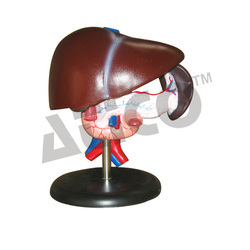 This model shows the basic anatomical structures of the liver. The complex vessels network in the opened liver, displayed in different colors in the liver model: hilus vessels, the extra-hepatic and intra-hepatic bile ducts. Mounted on a plastic base. Model on Base, 3 times enlarged. Size: 11.5 x 11 x 24 cm. 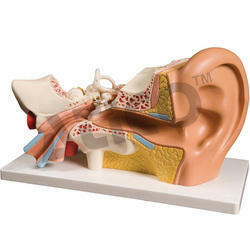 This model shows three main structural parts of the hearing organ (external ear, middle ear, internal ear) and the position of the equilibrium organ of human body. Dissectible into 4 parts, 5 times enlarged. 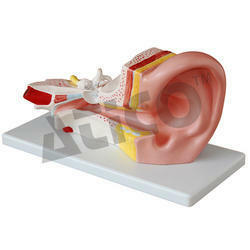 A middle model of the ear, for elementary science classes, shows all major structures related to hearing and balance. Dissectible into 2 parts, 3 times enlarged. Dissectible into 6 parts, 5 times enlarged. External nose: shows the section of the nasal bones and cartilages. Nasal cavity: on the lateral nasal wall show the superior, middle and inferior nasal chonchae project medially into the nasal cavity forming the superior, middle and inferior nasal meatuses. Paranasal sinuses: shows the frontal, sphenoid and maxillary sinuses. Magnified 1/2 the natural size. 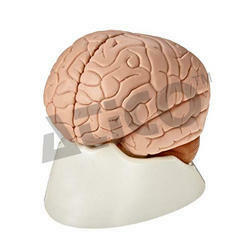 Demonstrate external features of human brain as a whole, as well as the relations between the component portions. Dissectible into 3 parts. Demonstrate external features of human brain and its arterial supply as a whole, as well as the relations between their component portions. External features of the brain: cerebral hemisphere, brain stem, cerebellum. The arterial supply of the brain: sources, vertebral, internal carotid arteries, arteria supply of the cerebellum and cerebrum. Tunica external: showing cornea and sclera with attachments of ocular muscles and optic nerve. Tunica media: showing the iris, the ciliary body and the chorioid. Refraction media: showing the lens and the vitreous body. This model is upgraded, change the eyeball to white color. 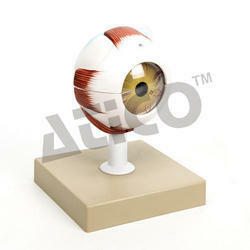 The model shows the eyeball with optic nerves and muscles in its natural position in the bony orbit. Dissectible into 10 parts, 3 times enlarged. Size of the various organs are equivalent to natural size. Section of bronchiole of no cartilage. The capillary rete in the alveolar sapta. A life-size model separating into 7 parts. The lungs have two removable lobes to show the internal structures, the heart bisects showing atria, ventricles and valves, the larynx bisects and the diaphragm is shown. A life-size model separating into 4 parts. 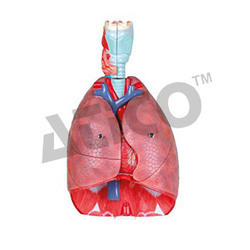 The lungs have two removable lobes to show the internal structures. This model shows a section of human skin in three dimensional forms. 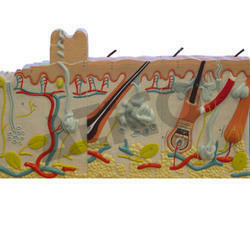 Hair, sebaceous and sweat glands, receptors, nerves and vessels are shown in detail. 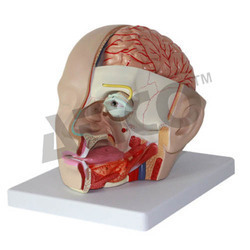 This model shows layers of skin, first rudiments of hair, sweat gland, sense organs of skin. 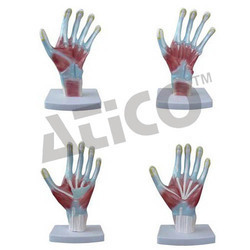 These life size models show the superficial and internal structures of the palm. This model shows the anatomical structure and the distal end of tibia of normal foot. 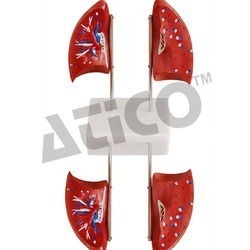 This model shows the anatomical structure and the distal end of tibia of arched foot. 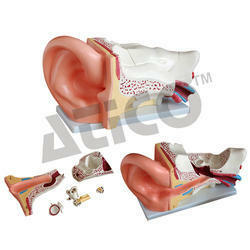 Looking for Human Anatomy Models ?